“We want to make our current systems redundant,” Musk said during a presentation at IAC. “One system, one booster and ship, that replaces the Falcon 9, Heavy, and Dragon.” In other words, the BFR is really about efficiency: instead of spending SpaceX’s resources on three separate rockets, they can be focused (in addition to income from launching private satellites and ISS re-supply trips) on one: a redesigned BFR. 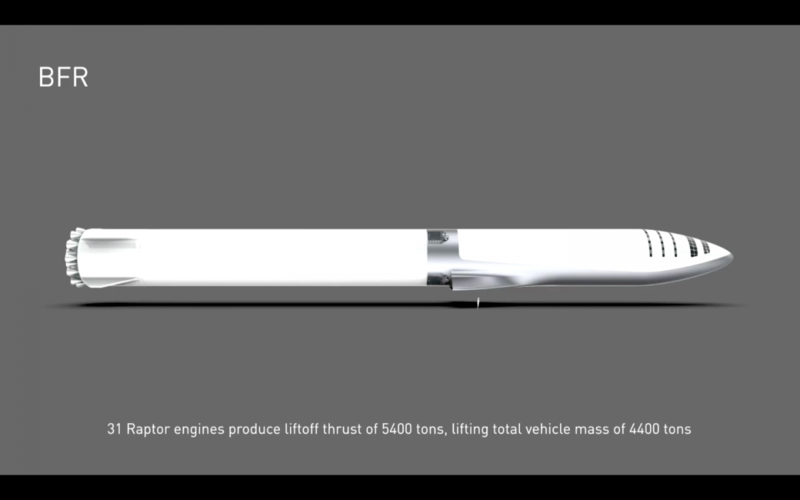 The new BFR is a bit smaller than the original, but it’s still massive: the rocket is 48 meters (157 feet) long, with a dry mass of 85 tons and capable of carrying 1,100 tons of propellant mass. The payload bay is eight-stories tall, with a pressurized volume of 825 cubic meters (29,135 cubic feet). Its transit configuration holds 40 cabins (which can hold two to three people each), large common areas, a central storage, a galley, and a solar storm shelter. 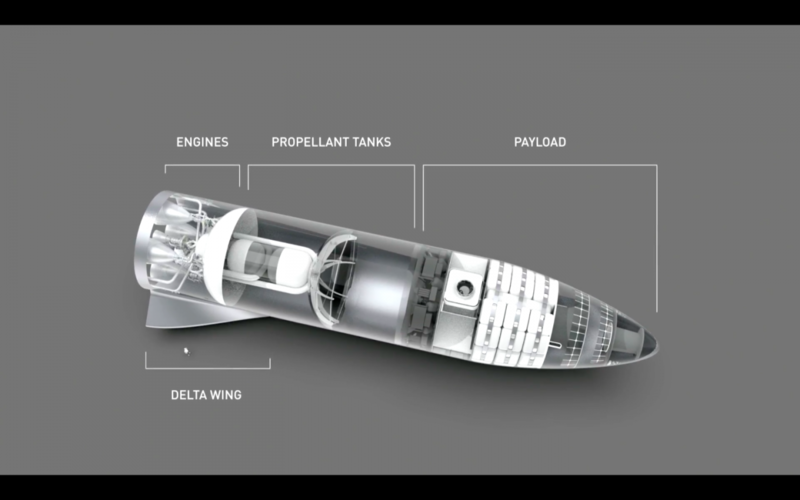 Capable of refueling in space, the BFR’s fuel tank can hold up to 240 tons of CH4 and its oxygen tank 860 tons of liquid O2. Upon its arrival to Mars — approaching the atmosphere at 7.5 kilometers per second — the ship could land using either one or both of its two center engines. “We want the landing risk to be as close to zero as possible,” said Musk. 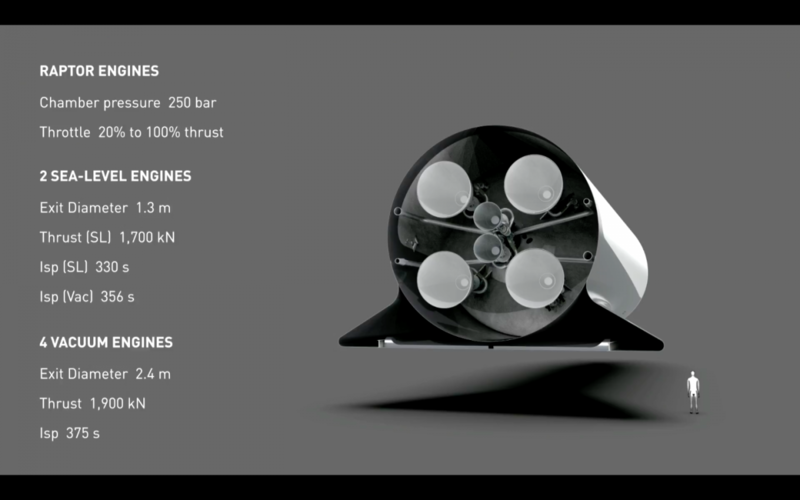 With all of these specs, SpaceX has calculated the cost of launching the BFR with its 150 ton payload to be cheaper than the Falcon 1 (0.7 ton payload). If SpaceX wants to just focus on one rocket, what would happen to the rest? Given the drive to operate efficiently, Musk said the rockets wouldn’t go to waste: SpaceX would keep the reusable rockets available for commercial use. 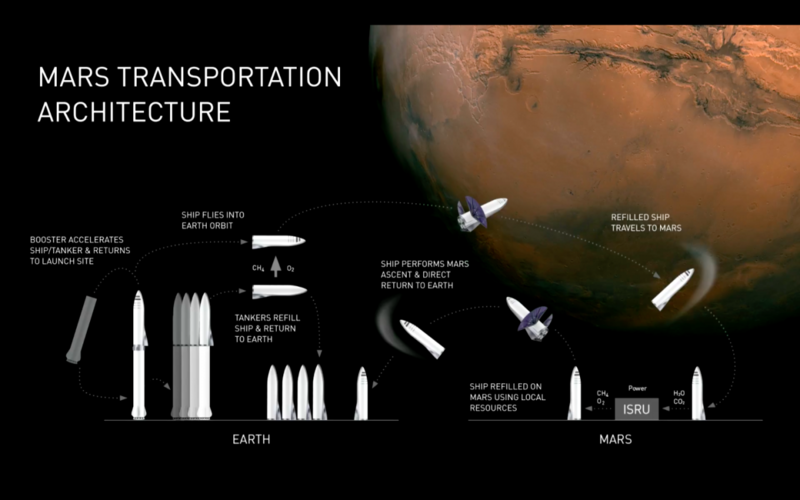 Even if we will be saying goodbye to the Falcon 9 and other rockets, Musk did present some very intriguing possibilities for the BFR. Aside from Mars, Musk envisions a BFR launching next-generation satellites, which could help clean up space debris and service the ISS. The BFR can also fly to the Moon and back — despite not having any local propellant production on the lunar surface. “It’s 2017,” Musk said, clearly amused. “We should have a lunar base by now.” Perhaps the BFR could also help with missions to construct a lunar base or a cislunar orbital station something that already may be part of NASA’s future plans. Basically, Musk envisions the BFR would be your friendly lunar-neighborhood transport. And what about Mars? Musk said they want to land at least two cargo ships on the red planet by 2022 to confirm water resources and identify potential dangers, as well as build infrastructure and life support in preparation for future missions. By 2024, two crew ships would bring the first people to Mars — with more supplies and cargo — to set up a propellant production plant and the beginnings of a base for expansion.